Tanzania has thousands of non-governmental organisations (NGOs) and civil society organisations (CSOs) working mainly in its health and education sectors. Education NGOs such as CAMFED, Hakielimu and many members of the Tanzania Education Network, a national umbrella of education CSOs, are working to promote and influence education policies and practices, and to ensure quality education to all people without discrimination. Health sector NGOs, such as PSI are working to extend health services to those who are least likely to get them. They are focusing most of their work on Malaria, reproductive health, child survival and HIV/AIDS. 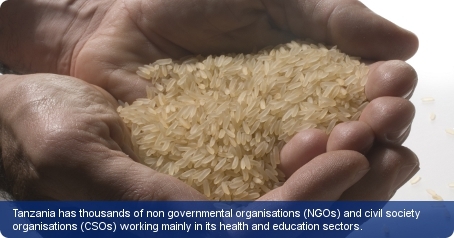 The Tanzania Association of NGOs (TANGO) is the largest and most recognised umbrella body of NGOs. Since its establishment in 1988, TANGO has actively engaged in and played a lead role in organising and co-ordinating NGO participation, locally and abroad. NGOs in Tanzania must register with the Director for Non-Governmental Organisations Coordination in accordance with The Non-Governmental Organisations Act, 2002. On registration NGOs must provide a copy of their constitution, full names and signatures of founder members, and the address and physical location of the head office of the NGO. One of the largest bilateral donors to Tanzania is Denmark, through its development association the Danish International Development Agency (DANIDA), who in the past, has donated around US $85 million towards economic growth and the improvement of living conditions for the poorest part of the population. The US Agency for International Development (USAID) contributes around US $20 million annually to support programmes in areas of health, the environment, democracy and the development of the private sector. The Trade Union Congress of Tanzania (TUCTA) is the national trade union centre and has around 370,000 members. The Trade Union Act of 1998 permitted the trade unions to be independent of the government but requested that they register with the Registrar of Trade Unions within six months of formation.